The ProForm 850T treadmill is part of the Tech Series of cardio machines featuring ProForm’s most up-to-date technologies including Quick™ Workout Apps and ProShox™ Lite Cushioning. 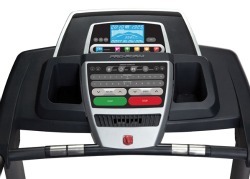 The ProForm 850T treadmill has a 6" backlit display showing speed, time, distance, and calories burned. The 23 Quick™ Workouts include 8 Calorie, 8 Timed and 8 Distance programs. An optional iFit® Live feature lets you choose among several advanced training programs while working out to the audio coaching of Jillian Michaels. With iFit, you also get access to Google Maps to download to run virtual trails all over the world. *requires iFit Live module (sold separately). UPDATE: The 850T treadmill is no longer available for sale. To find a comparable treadmill check out the new full lineup from ProForm to see which model appeals to you. 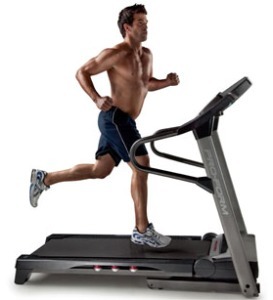 The ProForm 850T treadmill pairs a 2.5 CHP motor with a 20" x 55" tread belt, which is a decent combination. However, with the angle of the console support frame, the display panel is directly over the front section of the deck, making the running area seem even shorter than its 55" length. A long-legged runner will feel crowded by the design. On the plus side, the ProShox™ Lite cushioning helps to relieve some of the impact on joints when you walk or run. 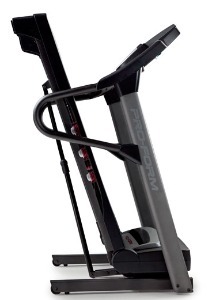 The treadmill deck supports a user weighing up to 325 pounds, while other features include a 12% incline, an audio plug-in port, workout fan, and a folding frame design. The warranty on the ProForm 850T is weak, but ProForm is currently offering a free 1-Year Extended Manufacturer Warranty with registration. Reviews on the 850T treadmill are mixed, mostly due to ProForm’s confusing promotions and price adjustments on several models including this one. 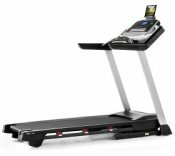 Reviewed at $1300, this model offers nothing to compare to leading treadmills at this price point, but priced with a steep discount, this model suddenly is more attractive. Except for the one-year parts/labor warranty, and ProForm’s poor customer service, this is a good machine in terms of noise, cushioning, programs, power, and reliability. At $799 to $899, the Proform 850T treadmill is an okay buy, but for anything more than that, you’ll get a better deal with one of the ProForm models mentioned above.